we are mostly using MDF and Moisture Resistant MDF. 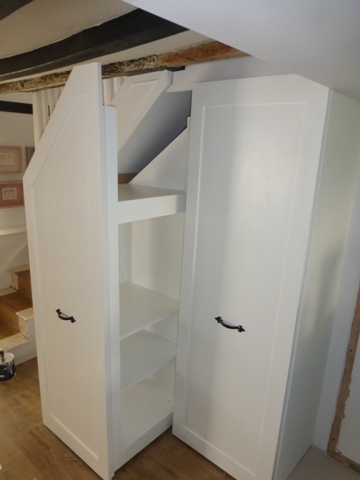 Here we mostly fit bespoke under stairs storage that are made to measure. This does not necessarily mean expensive. Using Moisture Resistant MDF or Medite board or even good old MDF is realitively cheap. Using moisture resistent board virtually eliminates the risk of shrinkage as moisture resistant boards naturally resist that very thing that contributes to shrinkage, which is drying out due to summer or central heating and swelling through damp because of winter or damage. All delivered at the very lowest prices. All work guaranteed, and made to the very highest of standards. Welcome to bespoke fitted under stairs storage fitted Using MDF and Moisture Resistant MDF. Here at London under stairs storage we mostly fit bespoke under stairs storage that are made using Moisture Resistant Medite or MDF this virtually eliminates the risk of shrinkage as moisture resistant boards naturally resist that very thing that contributes to shrinkage, which is drying out due to summer or central heating and swelling through damp because of winter or damage. All delivered at the very lowest prices. All work guaranteed, and made to the very highest of standards. As well as London under stairs storage fitted in London and London you might like to have some fitted hardwood under stairs storage made and fitted with that fully fitted look, perfect for those items we all find hard to place.. Or perhaps you are thinking of having some lovely fitted pull out bookcases under your stairs or perhaps it's time to get that under stairs floating shelves storage sorted out. With special rates available when your willing to pay your deposit now and wait for your installation till when I'm less busy. I am also fitting fitted bookcases; fitted alcove floating shelves and fitted under stairs shelves; fitted alcove units and cabinets with fitted floating shelves above look great and can incorperate that media centres. You can expect the very best in service. Fully customized fitted furniture in Romford London and London made to your exact specifications. I have many finishes available at affordable prices. On this page I'm showing examples of the difference between furniture fitted and how that looks compared to furniture that has the fitted look. I have understairs pull out storage solutions with the fitted look at the lowest prices around. 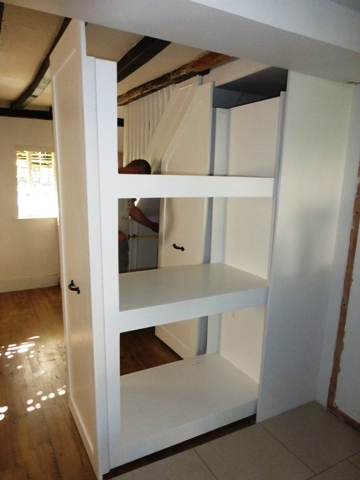 Affordable fitted home shelving Storage Units At The Best possible quality. Bespoke fitted under stairs storage If you work from home, or need extra space, I can create a Bespoke fitted under stairs storage . My Under stairs storage are available in areas covering Euston NW1, Fallow Corner N12 N3, Feltham TW13, Finchley N3 N12, Finsbury Park N4 N15, Fitzrovia W1, Fortis Green N2 N10, Fortune Green NW6, Friern Barnet N11 N12, Fulham SW6, Fulham Broadway SW6, Furzedown SW16 SW17, Gladstone Park NW2, Glebe Estate W4, Gloucester Square W2, Golders Green NW11, Gospel Oak NW5, Greenford UB6, Grove Park W4, Kinsbury, Ladbroke Grove, Lambeth, Lee,Lewisham, Leyton, Leytonstone, Liverpool Street, Long Ditton, Lower Edmonton, Maida Vale, Manor House, Manor Park, Marylebone, Mayfair, Merton, Mile End, Mill Hill, Millwall, Mitcham, Monument, Moorgate, Morden, Mortlake, Muswell Hill, Neasden, New Barnet,in London and N1 Angel, Barnsbury, Canonbury, Clerkenwell, De Beauvoir Town, Hoxton, Islington, Pentonville, Shoreditch,N2 East Finchley, Hampstead Garden Suburb; N34 and I will provide the perfect alternative to other forms of storage, this option gives more space for your books or display items, whilst at the same time creating more space. Storage solutions in period Victorian and Edwardian or new London homes vary in there appearance and so special attention is paid in the design phase, so that you get exactly the look and functionality you desire. The understairs pull out storage units that I make are individually trimmed on site guaranteeing a perfect fit for any wonky alcove or period Victorian house that may have not very straight walls. When the understairs storage units are finished there are no visible fixings or seams and every surface is finely sanded and gap-sealed to the wall. The units are fixed very firmly and can usually (depending on walls etc.) take loads in excess of 120Kg if necessary. The lighting options include the traditional halogen lights, which are not recommended any more due to heat considerations and now I also have available LED lights, these LED lights can be the traditionaly round lights look and the long strip LED lights too. In the past lights of one form or another have been used as lighting but now they can be used for mood lighting. I lovingly pre make, made to measure, hand crafted, traditional and contemporary and classic, wood or painted finished understairs storage, with a fast and easy and friendly service covering Euston NW1, Fallow Corner N12 N3, Feltham TW13, Finchley N3 N12, Finsbury Park N4 N15, Fitzrovia W1, Fortis Green N2 N10, Fortune Green NW6, Friern Barnet N11 N12, Fulham SW6, Fulham Broadway SW6, Furzedown SW16 SW17, Gladstone Park NW2, Glebe Estate W4, Gloucester Square W2, Golders Green NW11, Gospel Oak NW5, Greenford UB6, Grove Park W4, Kinsbury, Ladbroke Grove, Lambeth, Lee,Lewisham, Leyton, Leytonstone, Liverpool Street, Long Ditton, Lower Edmonton, Maida Vale, Manor House, Manor Park, Marylebone, Mayfair, Merton, Mile End, Mill Hill, Millwall, Mitcham, Monument, Moorgate, Morden, Mortlake, Muswell Hill, Neasden, New Barnet,in London and N1 Angel, Barnsbury, Canonbury, Clerkenwell, De Beauvoir Town, Hoxton, Islington, Pentonville, Shoreditch,N2 East Finchley, Hampstead Garden Suburb; N3. My reclaimed wood Floating Shelves are a must for anyone who wants to recreate that real authenticity and strength. I source reclaimed oak and pine from all over the uk. Lead times for this option are a bit longer, but the wait is worth it I am able to produce modern, chunky, thin or plain old brutish storage solutions. The modern elegant French antique white finish looks great and I will match your current setting and furniture. The white or wood finish bespoke under stairs storage can be installed by me, I'm a time served qualified and experienced carpenter and joiner, and I will fit into an alcove or on an open wall your specially selected and beautifully made pull out storage at my pleasure. All my bespoke under stairs storage are fitted with no visible brackets or supports showing, unless you require a more traditional look, and require under shelf supports. I will also be sure to not leave until strength and a fine finish has been attained. I pre make and pre finish everything as much as possible before I come to install and final adjustments are made to gain that special hand crafted finish with no visible fixings or seams and every surface is finely sanded and gap-sealed to the wall. Let me put together a collage of ideas for your perusal. It will be my pleasure to help. Fitted under stairs storage have worked out of a unit in Romford, North East London since 2007. I specialise in making and fitting under stairs storage. My preferred materials are Oak MDF and Ply, depending on strength and design requirements. Lead times are usually 2 - 3 weeks. 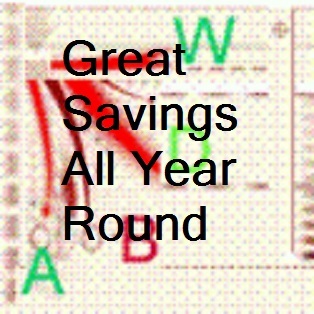 Prices are given on a job by job basis and I'd be glad to help. Welcome to London under stairs storage, I have both a manufacture and fitting service available. 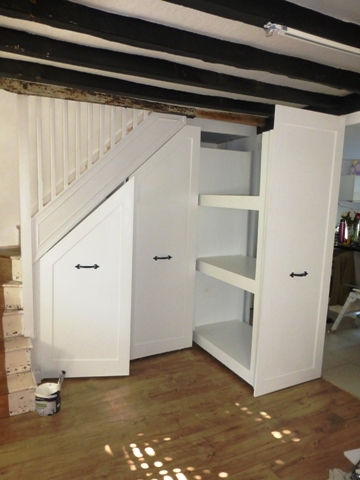 London under stairs storage can be both painted or stained, so feel free to inquire for your particular London under stairs storage requirements. London under stairs storage have worked out of a unit in Romford, North East London since 2007. 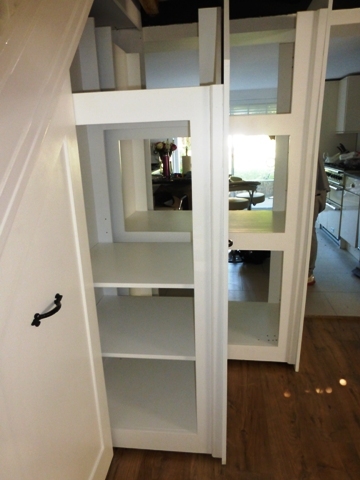 I specialise in making and fitting London under stairs storage. My preferred materials are Oak MDF and Ply, depending on strength and design requirements. Lead times are usually 2 - 3 weeks. Prices are given on a job by job basis and I'd be glad to help. 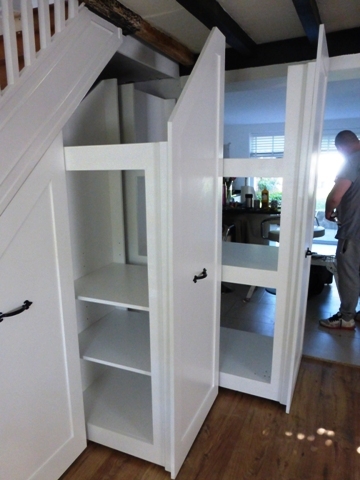 Welcome to London under stairs storage, I have both a manufacture and fitting service available. London under stairs storage can be both painted or stained, so feel free to inquire for your particular buildin Edwardian cabinets requirements. As well as traditionalshelving fitted in London and Essex you might like to have some fitted bookcases made and fitted with that fully fitted look, perfect for those items we all find hard to place.. Or perhaps your thinking of having some lovely fitted wardrobes or perhaps it's time to get that under stairs storage. With special rates available when your willing to pay your deposit now and wait for your installation till when I'm less busy. I am also fitting fitted bookcases; fitted wardrobes; fitted under stairs storage; fitted alcove units and cabinets; fitted bay window seats; fitted floating shelves; fitted media centres; and fitted libraries. You can expect the very best in service. 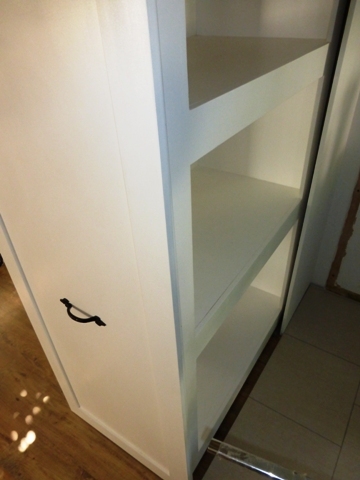 Fully customized fitted furniture in Romford Essex and London made your exact specifications. I have many finishes available at affordable prices. On this page I'm showing examples of the difference between furniture fitted and how that looks compared to furniture that has the fitted look. I have understairs pull out storage solutions with the fitted look and wardrobes supplied and fitted with the fitted look optional. At the lowest prices around. 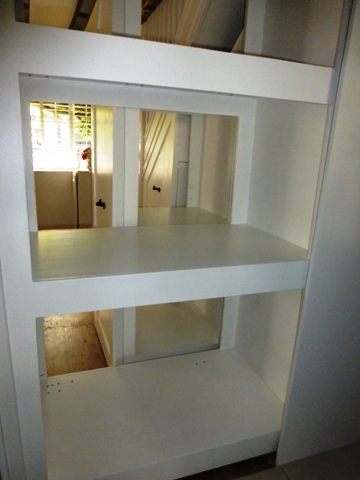 Affordable Fitted Home Shelving Storage Units At The Best possible quality. 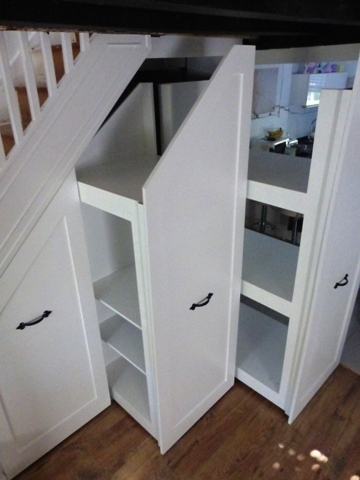 Bespoke fitted under stairs storage If you work from home, or need extra space, I can create a Bespoke fitted under stairs storage .